In a match made in wedding heaven, Ashley Beyer of Tinge Floral and Emmily Jones of Gatherist (formerly known as Charming Details) are teaming up to host STILL LIFE, a three-day floral design/educational workshop and retreat May 24-26 at the Washington School House Hotel in the charming mountain town of Park City, Utah. Whether you're a budding bloomsmith or just a lover of all things floral and foliage, this event is sure to be one for the style books. The line-up includes hands-on classes and demonstrations, one-on-one mentoring, guest teachers including Soil & Stem, welcome and farewell dinners, special gifts from Tinge and Gatherist, and film photos of your organic creations by Jill Thomas Photography. 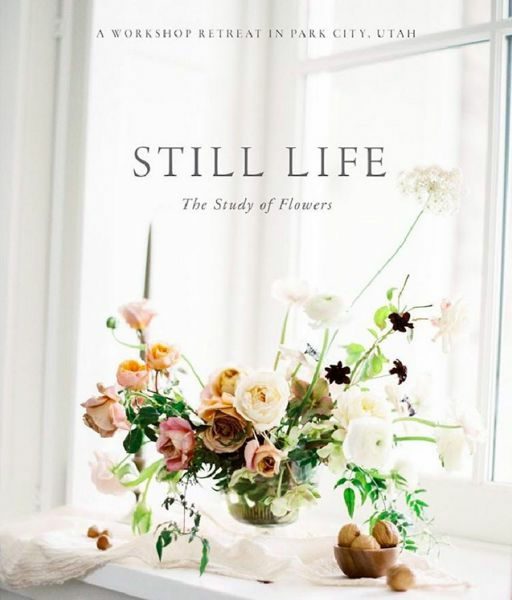 If learning from your floral idols and bunking up at one of the mountain west's poshest boutique hotels sounds like your kind of spring getaway, read on for more details about Still Life and how to reserve your spot. SMBG: Tell us about Still Life: What was the inspiration for the floral workshop/retreat, and what makes it different from other experiences? Ashley Beyer: The inspiration for Still Life really came from wanting to bring florists to the place that has brought so much inspiration to my work over the years. Utah provides so many unique and beautiful landscapes, and Park City is no exception. Emmily and I have been working together so much recently we felt it made sense to partner together and create a workshop experience for students nestled in one of the prettiest boutique hotels in the country. Not only is the workshop intensive on learning, we want to focus equally on the experience and the opportunity for florists to come unwind, refresh, and prepare for the coming wedding season. What can participants expect to learn and do at Still Life? Still Life will be heavily focused on florals and hands-on floral experiences. We'll learn bouquets, centerpieces, large installs, and we'll also talk about the business: how to make it successful and how to find your own unique voice in an industry that can be overly saturated. We'll also have a styling demo by Emmily, who will be styling the models for the bouquets. And we've invited Nicole Land of Soil & Stem to come do a demo on her bouquets and why she chooses the ingredients she does. Tell us about the venue: Why did you choose The Washington School House Hotel in Park City, and what makes it so special? The Washington School House Hotel has really been a dream location for a workshop for awhile. It's so soothing, clean, gorgeous, and the perfect backdrop for a retreat. It was kind of something we were shooting for the stars and hoping for the best, and lucky for us, they were so willing to work with us! We feel there is a lot of value in staying together and building relationships with other attendees and really enjoying every minute of the experience. I think the design in the space will inspire students. How can interested participants sign up for Still Life? You can sign up by visiting the Gatherist website and clicking on the "Still Life" tab. We're more than happy to talk about payment plans, as well. We only have three spots left, so sign up soon! Any other unique details about Still Life we should know? We named the workshop Still Life because we are greatly inspired by the Dutch still life paintings of the past and how they are inspiring current floral designers. Also, thinking about Still Life in terms of taking the time to slow down, be still, and remember why we enjoy the process of flowers. For me, flowers are therapeutic and soothing, and I think flowers have that effect on many people.